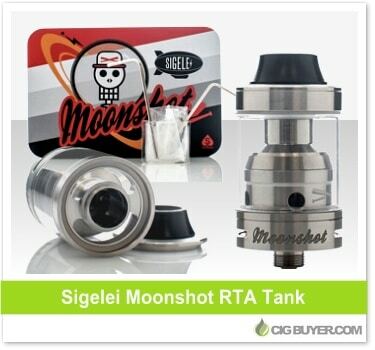 The new Sigelei Moonshot RTA is a high quality rebuildable tank designed to perform like an dripper. At just 32mm in height it’s super compact, with a flexible two post build deck that’s perfect for high-power dual coil builds. It features 2mm terminals, 24K gold-plated (direct contact) pin and quad 3mm wicking ports. The Moonshot Tank has 2ml of capacity and can be easily filled from the top. Plus, it has huge dual adjustable air slots (13mm x 1mm) that direct air straight to the deck for pumping out massive clouds of vapor.